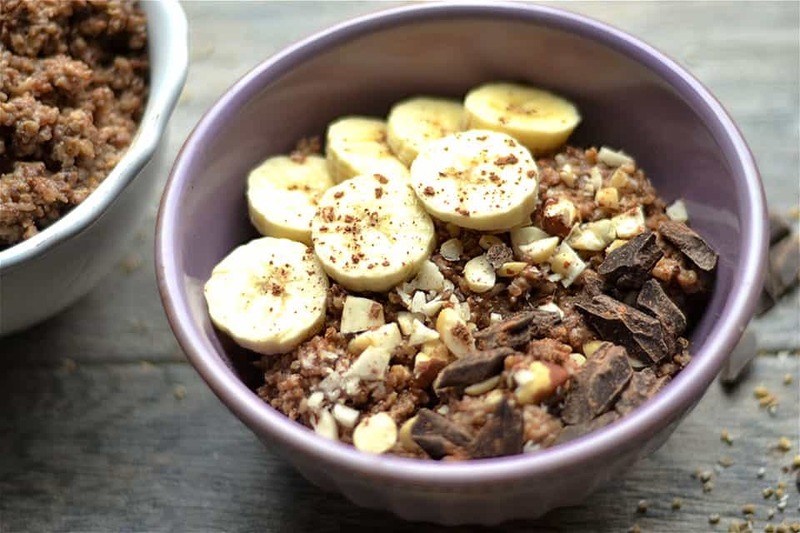 Slow Cooker Chunky Monkey Oatmeal and Quinoa is a super simple and nutritious way to enjoy breakfast! 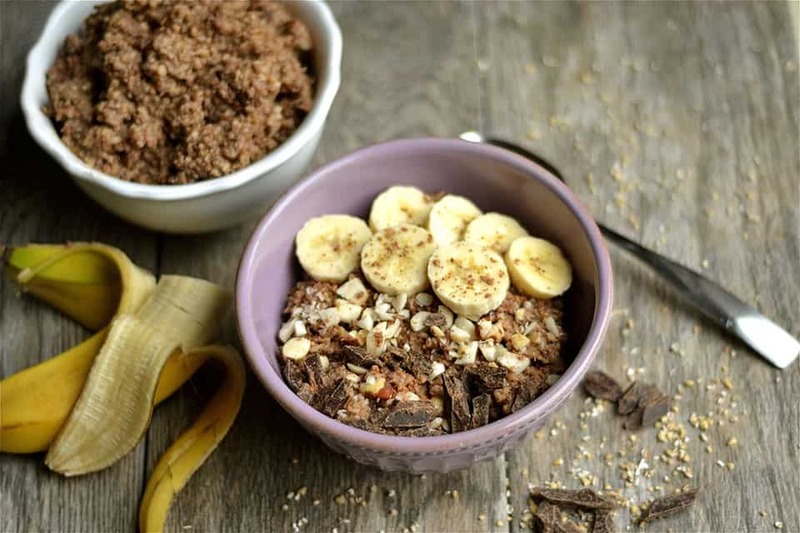 Chocolate, peanut butter, and banana all perfectly flavor the oats and quinoa for a delicious bowl your whole family will love. So how many of you grab a few bites of your kids breakfast after they are finished every morning? I do sometimes, even when it’s something I don’t really care for! This morning when I started eating a few bites of their breakfast, I realized I couldn’t stop. I wanted an entire bowl myself. Says the “I only eat eggs in the morning” girl. This one did it for me. And would you be surprised to hear I just finished some more after taking these pictures? It’s that good guys! And so ridiculously easy. Way easier than pouring a bowl of cereal, and way more nutritious. 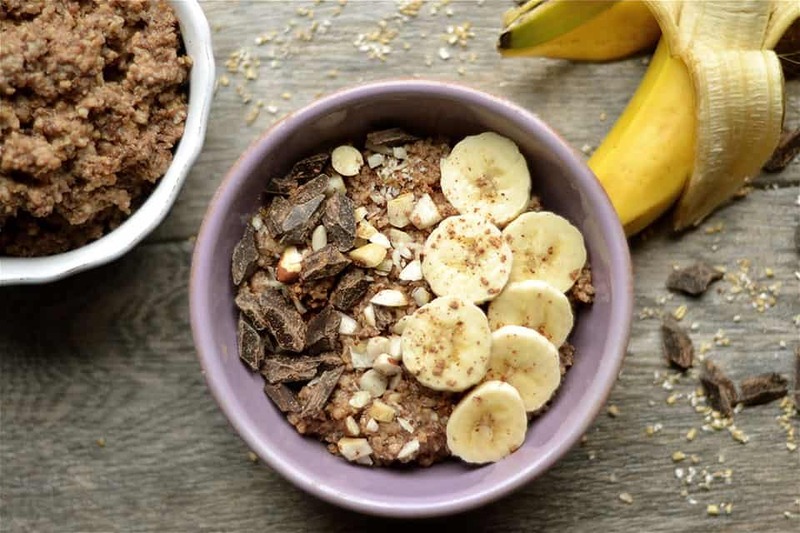 Steel cut oats and quinoa are both high protein and high fiber grains which are perfect for making you feel full longer. I’m all about that in the mornings. Throw in the additional peanut butter for healthy fats, bananas and cacao powder for taste and other nutrients: BOOM. Healthy and good. I did sprinkle on some dark chocolate chunks, cinnamon, and extra peanut butter just because. This *might* have been the selling point for the kids. Whatever. I’m just happy we have plenty for a few days! I then mixed in some more milk, peanut butter, and mashed up bananas. Top with extra chocolate, peanuts, peanut butter or bananas. Not necessary, but should be required 🙂 Yummy yummy, get in my tummy!! I do need to tell you a few important things. DO NOT use regular rolled oats, it must be steel cut or you will wake up to a bowl of mush (been there, done that). 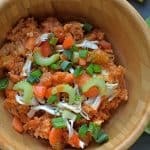 If you have a slow cooker that cooks fast, you may also wake up to a bowl of mush. 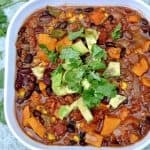 I am able to set my slow cooker for 4 hours low, and 4 hours warm. 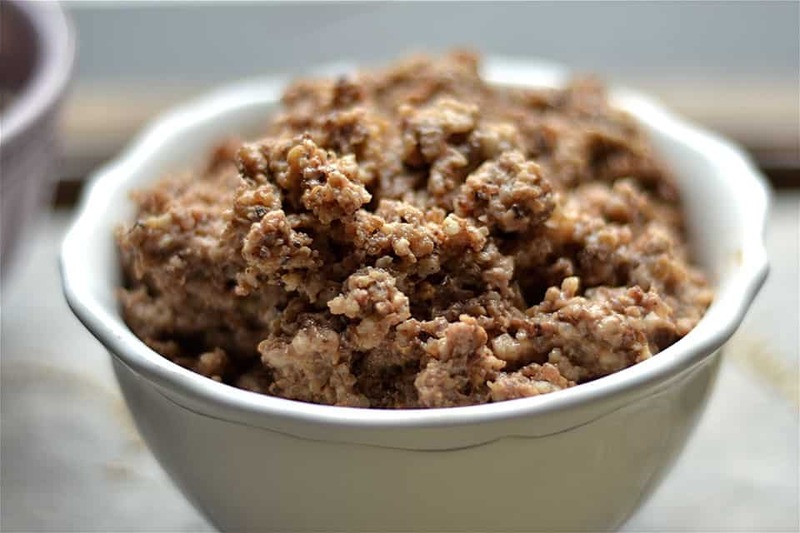 At night before going to bed, place oats, quinoa, almond milk, salt, maple syrup, cacao powder, and vanilla extract in slow cooker. Mix ingredients, and cover. Set your slow cooker to 4 hours low, followed by 4 hours warm (if possible). Alternatively, set slow cooker for 6-8 hours. In the morning, mix in peanut butter and mashed bananas. You may need to add in more almond milk if oatmeal is too sticky. 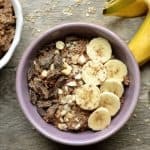 Serve immediately and top with dark chocolate chips, peanuts or additional peanut butter, cinnamon, and sliced bananas. You may also want to pour more milk on top of each bowl of oatmeal. *You can use any milk of your choice. You can also do part milk, part water, or all water. I prefer milk as it makes the oatmeal more creamy and flavorful. **Cacao powder is a more nutritious alternative to regular cocoa powder. But, cocoa powder or dark chocolate cocoa powder also works well in this recipe! What a beautiful and tasty breakfast! I love all things pb, chocolate and bandanna, especially for breakfast!